Industrial centrifugal fan blower wheels, pressure blowers impellers, ventilator fans blades, high pressure blowers, replacement fans and blowers high temperature oven fans; and wall / roof exhaust ventilators. Manufacturers and distributors of industrial, process and O.E.M. fans, blowers and ventilators. Chicago Blower, American Coolair Fans, Illinois Blower, Industrial Gas Engineering and ILG Fans. Industrial and O.E.M. customers with both process fans and blowers and general ventilation Fans. New York sales of industrial high pressure blowers and OEM venilating fans - from Buffalo, New York. Engineering of Canadian Blower / Chicago high temperature fans, process pressure blowers, regenerative pressure blowers; industrial blowers and fans. 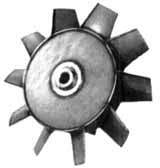 Canada Blower Company is a supplier of Industrial and Commercial fans and blowers of all types. Fiberglass Fans and Blowers: Canada Blower Co. is a major supplier of plastic and fiberglass fans and blowers for industry applications where aggressive media must be moved. Plastic fans include polypropelene, PVC, PVDF, fire retardant and UV resistant PPs. In the annealing and Pickling process acid baths are used to strip scale off the steel after the annealing process that smoothed out grain patterns that may have formed during the annealing process. Later on acids are used again to support oxidation. Pulp and paper manufacturers are very wide users of fiberglass blowers and other plastics fans for their boilers, exhaust and filtration systems. Canada Blower fans are the finest quality blowers available for efficient movement of corrosive, humid, or polluted air, gases, and fumes. These fire-retardant and corrosion-resistant plastic fans are specially designed and especially suited for hostile applications where coated metal blowers typically corrode. Canada Blower fans are proven thoughout the world and clearly recognized for superior quality, reliability, and efficiency. Canada Blower fiberglass fans housings are manufactured from premium grade, fire resistant resins that provide excellent corrosion resistance in most chemical environments. Canada Blower FRP impellers are made of premium vinyester that combines corrosion resistance with structural integrity under the stress of fan rotation.